We are excited for the new season! After our catastrophe of November 2014 I was determined to find a FINAL answer to our bird problem! And after asking around some more and seeing some new ideas we did find a raised net system that we could use with our blueberries! Having already put our plants in rows that followed the contour we needed some design help to be able to put in the new system. After much much hard work (yet again!) 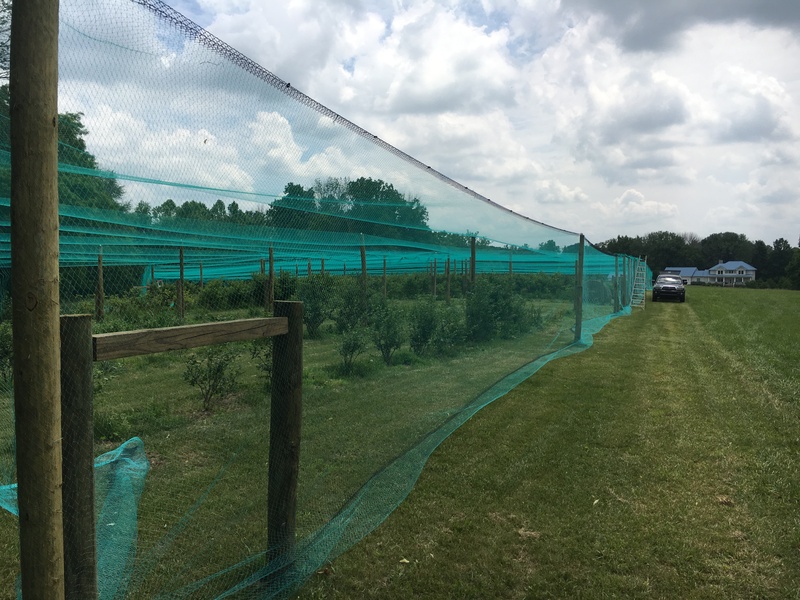 we now have our berries covered with more resilient netting. Hooray! This system allows us to keep the birds out and then after the season is over we just push the nets off to the edge, cover them up, and wait for the next year. Snow will not be our demise again. So we are expecting a good harvest uninterrupted with chasing the birds away before they get the berries and not us. We are not going to the Shelby County farmer’s market this year so we hope to mostly sell our berries by “you pick”. We sell our “you picked” berries at $2.80 a pound. Please let us know when you want to come pick to see if we will be here. Please call 889.7018 or 655.3043.